The greatest thing about the 3rd and 4th generation iPods were their top and bottom accessory ports. 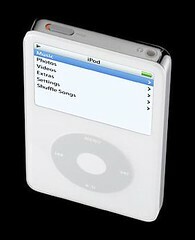 Say goodbye to the top power and control port on the 5th generation Video iPod. This means that remote controls and FM modulators like those from Griffin will need to be larger to house their own batteries. Unless, they are pushing power through the headphone jack, which I doubt. The bottom connector stayed the same, so your speakers from Altec Lansing, JBL and even the new iHome iPod alarm clock (which sounds GREAT! for $99!) will work with this new portable player. I was also suprized that they did not include the Bluetooth stereo profile (A2DP) for wireless headphones. This is also unfortunately disabled in the Motorola ROKR phone as well.